We are proud to announce that we have upgraded our Standalone HD Media Player which will now feature an Android PC board. This fantastic upgrade will have a host of improved features and is available for the same great price. This product is ideal if you already have a screen in place on which you want to display your images and videos. It’s so simple – copy your files onto a USB stick, plug this into the media player and hey presto, your images and videos will play on screen in a continuous loop. Faster Processing Time – the Android PC board makes it quicker than ever to copy your images and videos over from your USB stick to the media player. • 4 x Internal Memory – the new model has an 8GB internal memory, compared to our previous model’s 2GB. • Easily Network Upgradable – these media players are future proof and can easily be changed to a network media player in the future, meaning you would be able to remotely update your media player over the internet. • Run 3rd Party Standalone Apps – You can now run your own Android compatible third party standalone app. 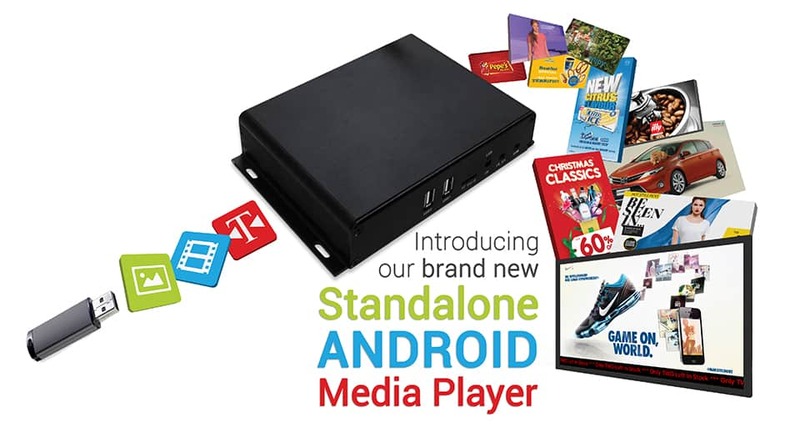 We will no longer hold any stock of the old Standalone HD Media Player (PPHD) however the new Standalone Android Media Players (PPHD5) are in stock now and available for immediate dispatch. For the latest prices and special offers click “Reply” to this email or give us a call on 0121 421 4458.